I can't believe Halloween is already here! While I'm not big on getting in a costume, I do LOVE candy and to me that is what Halloween is all about - it feels like the epitome of Fall. My neighborhood gets super packed on Halloween with kids in their costumes so I'm kind of excited to come home after work tomorrow and to see everyone. Some of my fondest childhood memories are from Halloween. When I went trick-or-treating I used to bring a pillowcase so I could carry the maximum amount of candy and I remember the excitement of pretending to be something else for a night. One of the best parts was coming home and sorting through all of the candy. I was probably on a permanent sugar high for the next several weeks after Halloween. 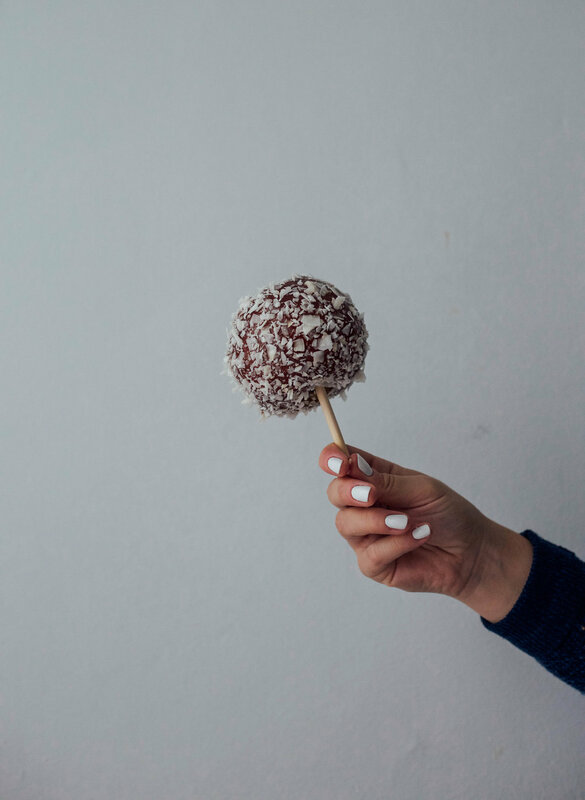 Speaking of Halloween and how it's the epitome of Fall, another one of my favorite things as a kid was apple picking and then getting a HUGE candy apple in the farm store afterwards. The combination of apple and caramel is just so so good. 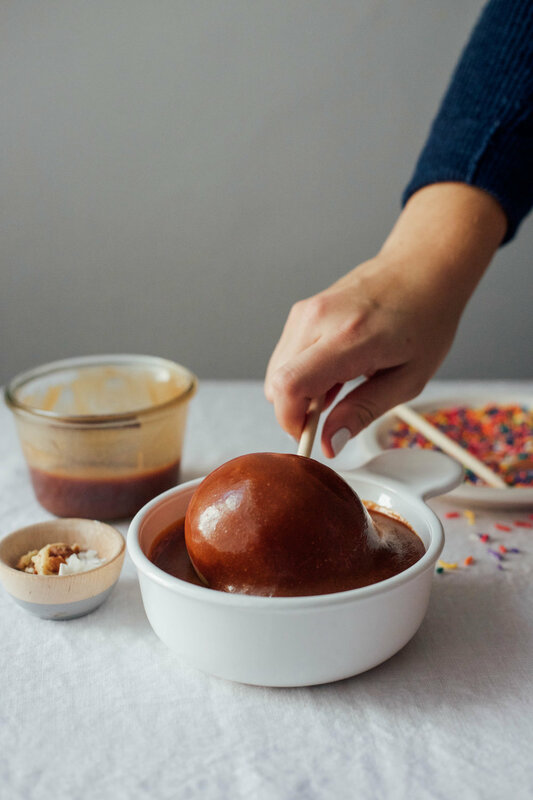 Last weekend I invited my sister and our friend Nica over and we made DIY caramel apples! It was super fun (and messy) and we had the best time adding on random toppings. 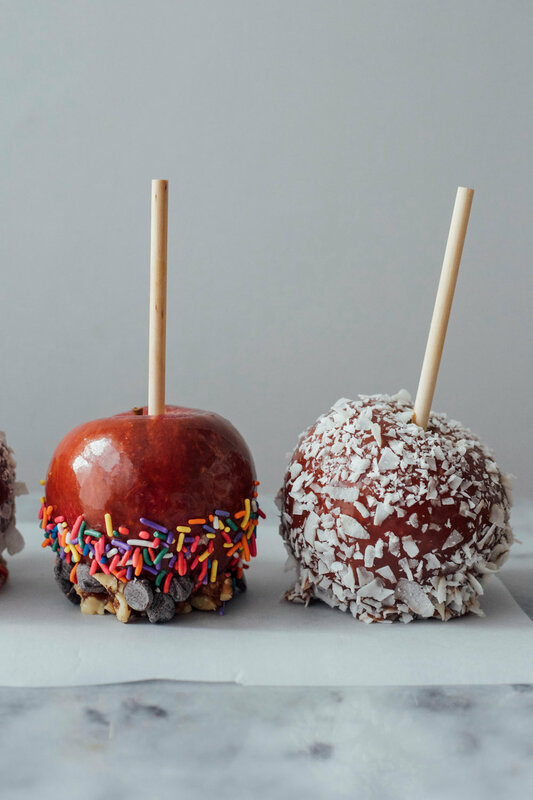 If you have any leftover apples, these are super easy to make. I also like to force myself into believing that they are healthy since apple is a fruit after all. Guys, for the candy apple bar Molly, Nica, and I created, I made three different kinds of caramel. Yes, THREE! They were each delicious in their own way. I've included recipes for each, as well as a list of toppings we used. For caramel apples, I suggest using large fresh apples (even better if you can get them from the farmer's market or pick them yourself). 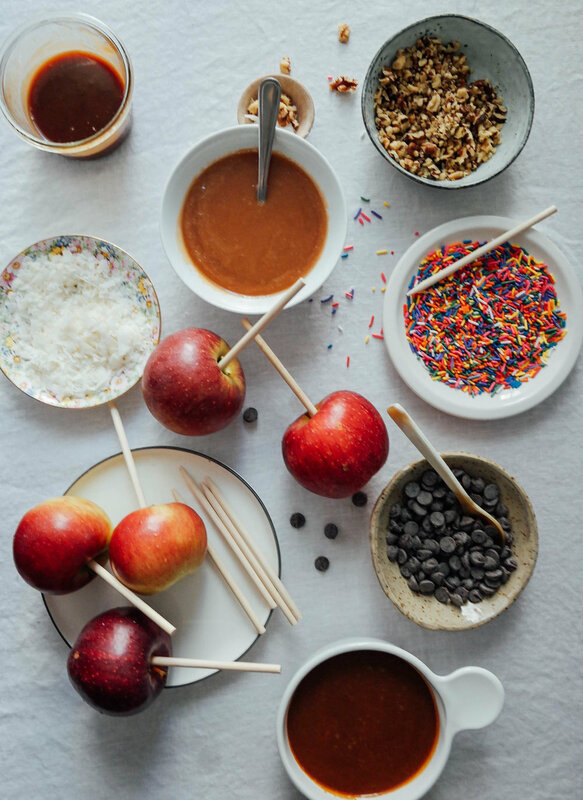 You also want to make sure the apples are super dry before dipping them in the caramel. 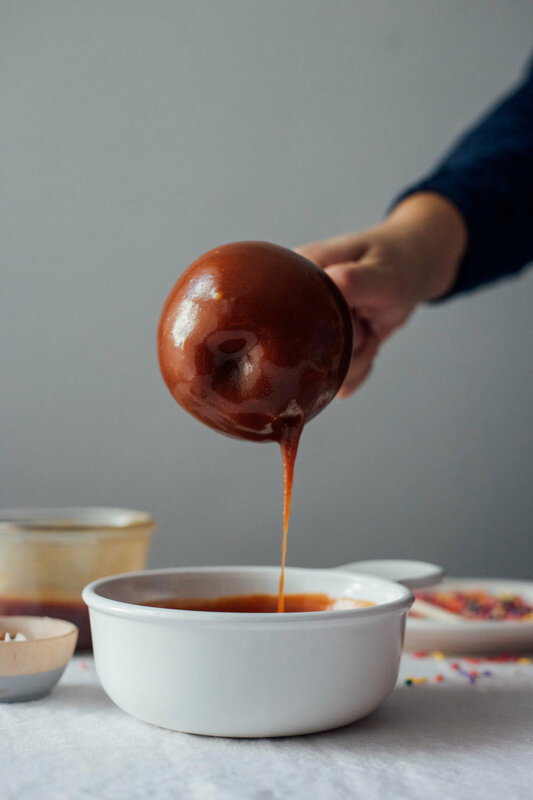 Let the caramel sauces cool to room temperature before dipping, and then wait until the caramel sets before adding any toppings. In a medium stainless steel saucepan set over medium-high heat, combine the sugar with 1/4 cup cold water and stir to combine. Cook, without stirring, until the sugar has turned a deep amber hue, about 10 to 12 minutes. Meanwhile, warm the cream in a small saucepan. When the caramel is ready, slowly whisk in the warm cream and continue simmering the mixture until it is smooth, another 2 to 3 minutes. Remove from heat, then whisk in the butter, and then the salt, to taste. Serve warm and over ice cream. Add in more salt if desired! Meanwhile, warm the cream in a small saucepan. When the caramel is ready, slowly whisk in the warm cream and continue simmering the mixture until it is smooth, another 2 to 3 minutes. Remove from heat, then whisk in the butter, and then the salt, to taste. Add bourbon at the end and stir. Bring sugar and 3 Tbsp. water to a boil in a saucepan over medium-high heat, stirring to dissolve sugar. Boil until sugar begins to caramelize in spots. Stir with a heatproof spatula and cook, stirring occasionally, until the color of honey, 5–7 minutes. Reduce heat to medium-low and cook, stirring occasionally, until caramel is a deep amber color, about 5 minutes longer. Remove caramel from heat and carefully whisk in tahini and butter, then cream, and salt.